(Minghui.org) More than 30 years ago, I was diagnosed with a bone tumor. It was the most difficult time in my life. My husband was injured at work and hospitalized. We had a small child and were in dire financial straits. Due to the extreme pain caused by the bone tumor, I agreed to very innovative treatment that was still being tested. Doctors removed two pieces of my tumorous femur and replaced them with pieces of my own bone. They inserted two-foot long steel rods into my bone marrow. The rods were welded together and then secured with four one-inch-long screws and two sets of steel wire. Less than a week after the surgery, the steel pieces broke inside my body and the marrow became infected. I could not move, speak or even cry. It was like I was in a coma. Fortunately, I survived. I lay in bed for two years without moving, wrapped in plaster from my feet to chest. Afterwards, for the next ten years I could only walk with the help of two canes. My physical health was also poor. I had an irregular heartbeat. I could not easily digest cold food. I could not lift or carry anything remotely heavy. Doctors were very worried about me. They often reminded me that a bone tumor was not curable and I could easily die if I did not take good care of myself. Despite my weak condition, I still fought for fame and profit. I dismissed their suggestions because I still longed for those benefits in everyday life. I was only able to let go of those attachments and gain peace of mind 20 years ago, after I started to practice Falun Dafa. As soon as I started, I experienced miraculous physical changes. My heart rate became regular within oan hour after I started the practice and has been normal ever since. Within two weeks, I was able to walk without a cane. I no longer had any digestive problems. I got stronger. Now I can lift ten pounds with one hand. Even my nearsighted eyes became normal after decades of wearing glasses. I sustained several accidents without injury. I once fell and hit the back of my head, which caused a huge lump. I sat up immediately. A half hour later, as I was studying the Fa with a group, the pain was gone. Another time I fell down a flight of stairs. I stood up and walked away without a problem. I had three accidents that fractured bones but completely recovered within days by keeping up with daily Falun Dafa exercises and studying the Fa. I am now in my 70s. In the past 20 years, I have not spent a penny on medicine or treatments and have been healthier than ever. Falun Dafa gave me a new life. If more people practiced Falun Dafa, our world would be a much better place! (Minghui.org) When Ms. Gao Ping was just a child, her mother was struck with various chronic illnesses. Being the eldest child in her family, Ms. Gao took care of her siblings and did all the chores, as her mother was too ill to do anything. Later on in life, Ms. Gao herself experienced severe health problems. It was Falun Gong that saved both her and her mother’s lives. Married life was not easy for Gao Ping. After the birth of their son, her husband began to indulge in alcohol and frequently got drunk. He could not maintain a regular job, and usually beat his wife when he’d been drinking. Physical abuse gradually became part of Ms. Gao’s life, from a few times a month to every day. She was covered with bruises and wounds. Ms. Gao’s husband would even go to her workplace to antagonize her. Her manager told her to control her emotions and avoid trying to stand up to him so that he would stop beating her. She, therefore, tried not to defend herself from her husband’s assaults, so her husband changed from physical abuse to mental abuse – he yelled at her and kept her from sleeping until he himself was physically exhausted. Working all day and doing all the household chores at home, coupled with sleepless nights, Ms. Gao felt that her life was hopeless. So she filed for divorce and got custody of her then six-year-old son. Not long after the divorce, Ms. Gao’s husband went to her workplace and stabbed her twice in front of her co-workers. The knife punctured one of her lungs and severed a blood vessel to her heart. Unable to afford medical treatment, Ms. Gao quit her job to rest at home. The heart injury created a series of other physical problems that eventually led to a stroke and caused her to have severe headaches. Her life was full of pain and misery. Ms. Gao got married again a few years later to a doctor of Chinese medicine, who helped cure many of her ailments, except for the heart problem and the sequelae from the stroke. Half of the blood vessels in her brain were blocked, causing headaches. Ms. Gao’s mother suffered from scores of serious illnesses. However, her fragile condition was dramatically improved in 1997, a few days after she began to practice Falun Gong. Over a dozen years have gone by, and her mother is still very healthy. After Ms. Gao was diagnosed with the blocked blood vessels in 2009, her mother urged her to practice Falun Gong with her. She had actually taught her daughter the Falun Gong exercises in 2004, but she hadn’t taken it seriously back then. Afraid of the severe consequences of her ailments this time, Gao Ping agreed to practice with her mother. Not long after Ms. Gao began to practice Falun Gong, all her illnesses disappeared. Witnessing miracles twice in the same family, her family and friends were all deeply impressed by the healing power of Falun Gong. Many of them began to help practitioners impacted by the persecution and told others about how Falun Gong can bring good health and other great benefits to those who practice it. (Minghui.org) My husband was suffering from persistent back and knee pain. He went to the hospital in the fall of 2007 and was diagnosed with a protruding lumbar disc. His condition was treated with medication and physiotherapy until March 2009, but his condition worsened, and he lost the ability to walk. We went to another hospital for a second opinion, where my husband was diagnosed with end-stage femoral head osteonecrosis. This means that there was little or no blood supply to the upper femur and the hip socket, causing the bone to die. Eventually, the bone would disintegrate. Stunned, we consulted yet another hospital and received confirmation that that diagnosis was correct. We were informed that he would need surgery to replace the damaged joints. Replacing both hip joints would have cost us forty-thousand yuan, and that did not include the cost of surgery and medications. We did not have the money. We were shaken and could not think of a way to pay for the operation. Our two sons were saving up for their upcoming marriages, and none of our friends or relatives could offer us enough financial assistance. Moreover, this operation would not completely cure his condition! Practitioners encouraged him, and my husband began to cultivate in Falun Dafa. Our compassionate Master immediately began purifying his body; his legs sweated throughout the first night. My husband could not perform the fourth exercise in the beginning because he could not squat. However, within a month he was able to do all the exercises. He was walking with a cane three months later, he could walk without any help in eight months. In just over a year he was recovered completely and was able to return to work. Our entire family is indebted to Master Li for curing my husband. No words can fully express our gratitude! (Minghui.org) My life had been very difficult for many years. Things at work were unpleasant with everyone fighting with one another, trying to get ahead, and the competition was overwhelming. As a result, I did not eat or sleep well. My health was poor. I had chronic pain, dizziness, and a very troubling heart condition. I felt pessimistic. No amount of pills, injections, or physical therapy helped. On a daily basis, I suffered from chest and back pain, an irregular heartbeat, and shortness of breath. I fell down several times on my way to work, rendering me unconscious. The last time it happened, I felt like I was on the verge of death. The feeling persisted, and I was always worried. Since I felt like I was dying and had nothing to lose, I decided to try cultivating Falun Dafa again. I contacted someone who practices and borrowed a copy of the book The Great Way of Spiritual Perfection. Because of the persecution, it has been difficult to acquire Falun Dafa books, so I hand copied it and gave back the original. I would transcribe the book after my grandson went to school. I even drew all the exercise figures and diagrams. It took me nearly three hours just to complete the pictures. When I was done, I felt as though my body had been completely transformed. I felt like a strong and healthy young man. I no longer sensed that I had any health problems. I rode my bicycle to my grandson’s school to pick him up. Pedaling the bike was easy—it felt like someone was pushing me along. Since I began practicing Falun Dafa again, I have been in excellent health. The results of a complete heart exam showed that my heart disease was gone. My doctor was very pleased and curious about my improvement. I sincerely thank Master Li Hongzhi for giving me a new life. (Minghui.org) I am a retired 75-year-old primary school teacher. I had late stage esophageal cancer, heart disease, high blood pressure, and insomnia before 1995. All my illnesses disappeared soon after I began practicing Falun Gong that year. I have been healthy since then. I expectorated blood from my lung cavity when I was in 20s and had heart disease and high blood pressure when I was 30 years old. My high blood pressure was severe and often read at 230. My pulse rate was often around 120. I had vertigo and often experienced a sensation of spinning. Yet the most devastating occurrence was when I was diagnosed with late stage esophageal cancer in 1992. I was 51. Surgery was conducted to remove my diseased esophagus and cardia. My stomach was moved upward to connect with my remaining esophagus. The connection suture made the passageway to my stomach narrower. I had a hard time swallowing food after that due to a tendency for blockage to occur in this area. Unfortunately I contracted hepatitis C from a blood transfusion during the surgery. I also had severe insomnia due to problems with my central nervous system. I often stayed awake the whole night. My life was miserable during this period. Three years later, the cancer relapsed and spread. My daughter started to prepare for my death. Fortunately, a friend of my daughter’s practiced Falun Gong. He told her about Falun Gong’s marvelous effect in healing illnesses and suggested that she let me try it. I was bedridden by then. I listened to audio recordings of Master Li’s lectures in bed. Two weeks later I could get out of bed and do some household chores. Soon after I began practicing Falun Gong, all of my illness symptoms disappeared without my taking any medication and I slept well at night. The connection between my stomach and esophagus seemed to have enlarged, as I have felt no blockage since then. Falun Gong gave me a second life. I was arrested and detained four times after the Chinese Communist Party initiated the persecution of Falun Gong in 1999. My home was ransacked five times. I could not eat for over 20 days when I was held in a detention center. People thought that my esophageal cancer had relapsed. The authorities did not want me to die in the detention center, so they sent me home. Soon after getting home, I was able to eat a few bowls of pureed food. I recovered soon after and have been completely healthy since then. (Minghui.org) A practitioner’s elderly mother was snatched from the jaws of death through practicing Falun Gong. She tells this story, as well as her own miraculous recovery from chronic illnesses. My dad passed away in his forties after a long illness, and mom had to carry the family on her shoulders. She finally broke down from constant overwork and all kinds of illnesses, including a severe heart condition, rheumatoid arthritis, tuberculosis, vasculitis, cirrhosis of the liver, a prolapsed uterus, lack of blood to her brain, cataracts, and cholecystitis. At one point, she was in critical condition and was unable to eat or drink for almost nine days. I visited her on a Wednesday afternoon when I was able to get off work. As I stepped into the house, I saw a big puddle of bile on the floor. I asked my mother if she had taken her medication. “I can’t drink any water, let alone take my medicine,” she said in despair. As I left for home, I asked Master for help. I got home around 2:00 pm and began my Falun Gong exercises. As I did the second set, tears ran down my face. My understanding of the Fa was rather shallow at that time, as I had obtained the Fa only three months before. I finished the exercises around 3:00 pm. After I put some rice in the rice cooker, I went to see how my mom was doing. To my great surprise, I saw through the window that my mom was sitting on the bed and her face was all smiles. She said that around three o’clock, she began to feel as if a gentle current was running through her whole body. Her pain disappeared, and she was able to rest for the first time in a long time. When she opened her eyes, she did not feel dizzy. She sat up, got off the bed, and walked around a bit. “Master saved your life,” I said. Mom believed me. That evening she ate a big bowl of rice and began to do the exercises. She had trouble lifting up her right arm, which had been disabled for over thirty years. After about two weeks, she could raise her right arm over her head. Two or three months later, her complexion turned a healthy pink, and wrinkles disappeared from her face. She has since completely regained her health. She now does household chores without a problem. I remember a spring day in 2005 when my mom, 79 at the time, carried lunch for 16 people into the fields. It was nearly four miles each way, which was an unimaginable feat for her just months prior. 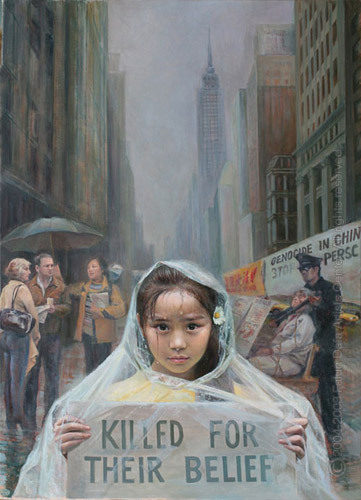 Around the 2008 Beijing Olympic Games, Jiang Zemin and his followers illegally arrested many Falun Gong practitioners. The local police station and neighborhood committee tried to find out where I was living, too. In order to make it easy for me to keep away from danger, my relatives took my mom under their care. Three days later, suddenly I felt teary in my right eye, and instinctively I felt that something must have happened to my mom. I rushed to my elder brother’s place and saw a big coffin in the middle of the yard. My brother was surprised to see me and said that he didn’t tell me what happened to my mom for fear that I might be arrested. He told me that mom had a fall and had been in a coma for three days and nights. She had been on an intravenous drip, but it didn’t help at all. I went to my mom and called out to her. Mom opened her eyes and asked if I was safe. I told her I was fine and encouraged her to keep faith in Master and in Dafa. I told her not to be afraid and regard herself as a cultivator. Then I started to read Master’s poems to her. Soon afterwards, my mom sat up and looked better. My elder brother found it inconceivable and said to me: “How come as soon as you came, mom became better?” I told him that it was not me, but our Master, who had guided me to come wake her up and help her to strengthen her faith in Master and Dafa. It was due to the boundless compassion of our Master that such a miracle could happen. I will turn 63 this year. I had suffered from problems with my liver, gallbladder, lungs, kidneys, and heart. I had headaches and low blood pressure, an irregular menstrual cycle, and rheumatoid arthritis. Before practicing, I tried all kinds of treatment with little effect. I became deeply depressed. I tried some sham qigong practices and even converted to Buddhism. One day in 1995, a colleague told me about a veteran government official who had severe diabetes. One of his relatives had attended Falun Gong classes in Harbin, and afterward his illnesses had disappeared. This official obtained a copy of Zhuan Falun and lent it to others to read. He and his relative came to teach us the exercises and play a recording of Master’s Fa lecture. Many people attended and the hall was full. As Master mentioned in Zhuan Falun, I fell asleep as I was listening to the Fa lecture. When I awoke, I felt very good and full of energy. My mind became clear. I never again had a headache. All my other illnesses also disappeared, and I never needed medication again, not even a pill. It was all lies when the TV station broadcast programs that said Falun Gong forbade people to take medicine. Since I started the practice in 1995, I have turned into a new person. Thank you, Master, for your compassionate salvation! (Minghui.org) I have been practicing Falun Gong for only four years now, but I’ve experienced a complete renewal of body and mind. I used to be a strong-headed person and often got mad at others. I also often criticized others for small problems, and often had jealousy. Perhaps due to my negative mindset, I developed a uterine tumor in 2011. The tumor was so big that it could be felt with bare hands, and was extremely painful. I didn’t know much about Falun Gong, but I never had a good impression of the Communist Party, because I knew that it often lied. So, despite the Party’s propaganda, I didn’t have any negative feelings towards Falun Gong. Then the doctor told me that she is actually also practicing Falun Gong, which healed her hypertension in only 10 weeks. She didn’t have to take pills and felt energetic. I was interested, so I asked her to teach me the exercises. She gave me a copy of Zhuan Falun (the main book of Falun Gong) and the exercise instruction videos. After I finished the book and videos in a few days, I felt that I found the answers to a lot of questions that had lingered in my mind for a long time. Why are some people rich, but some poor? Why do people get sick? How could improving one’s moral standard heal sickness and what is the karmic relationship? The book Zhuan Falun answers these questions, which cannot be answered by modern science. From then on, I have tried to follow the principles of Truthfulness-Compassion-Forbearance. I’ve become more peaceful and calm. I try to treat others with sincerity, broaden my heart, and forgive others when offended. It’s been amazing to see how treating others with kindness is met with kindness in return. My life has become smooth and bright. Two months after I started practicing Falun Gong, I had severe pain in my lower abdomen. I knew from having read the book, that this was a symptom of my body being purified. I kept practicing and reading the book. While feeling the pain, I sensed something black and filthy going down from my body and leaving through my feet. An hour later, I felt relaxed and warm in my belly. It was a wonderful feeling that I never experienced before. The same thing happened a few times later. Two years later, I was completely healed, with no symptoms or sign of a tumor. I was renewed, body and soul. Now, I am a happy person with a broad heart. I am energetic every day. Other people say that my skin glows, which makes me much younger than my real age. Looking back, if I listened to the Communist Party’s lies, and held misconceptions about Falun Gong, how would I be where I am now? I sincerely thank Master Li Hongzhi. I hope that those who still have negative attitudes towards Falun Gong will read Zhuan Falun themselves. If you read the book, you will know that Falun Gong is good, and Truthfulness-Compassion-Forbearance is good.